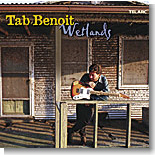 Our reviewers liked the new CD, Wetlands, from Tab Benoit so much that everyone wanted to cover it. We've got two rave reviews of the disc in this month's Pick Hit. Soul/blues singer Artie "Blues Boy" White wanted to finally capture his own sound on CD, so he started his own label. Check out his latest, Can't Get Enough, our Surprise feature this month. We cover some classic soul in a re-issue of vastly underrated singer Bobby Womack's best MCA hits. You can read all about it in the Flashback section this month. This month's What's New section features new releases from Jimmy Dawkins, Gov't Mule, Johnny Rawls, Chick Willis, Blues Boy Willie, Mel Waiters, Roy Rogers, Willie Kent, and more.